Spectacular views combined with delectable food provide the perfect dining experience. 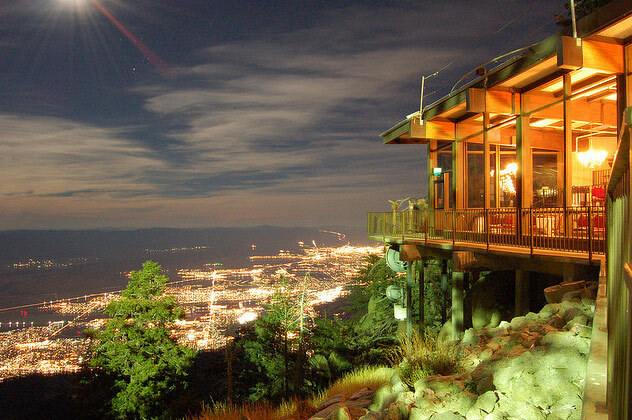 There are two dining options at the top of the Palm Springs Aerial Tramway. Peaks, a fine dining experience with a breathtaking view of the Coachella Valley and Pines Café, a cafeteria-style restaurant. Both restaurants are open for lunch and dinner. Includes Tram admission and dinner in Pines Café from 11:00 a.m. to 8:00 p.m. $36.00 Adults/Seniors and $23.50 Children (ages 3-10). Note: This package is available for purchase from 8:00 a.m.
Includes Tram admission and breakfast in Pines Café from 6:30-10:00 a.m. $25.95 Adults /Seniors and $16.95 Children (ages 3-10). Note: This package is only available for purchase between 4:30-7:30 a.m.
A Culinary Experience Above the Clouds. The chefs have created a menu featuring a variety of fresh vegetables and greens from the Coachella Valley, dry aged meats and poultry along with fresh breads from local bakeries. Additional selections will include market fresh seafood and pastas. Children’s menu available. Reservations are recommended. Call (760) 325-4537. Recently named #8 on Architectural Digest’s list of the World’s Best Cliffside Restaurants. A cafeteria-style restaurant, Pines Café is open daily from 11:00 a.m. – 8:30 p.m. and offers a variety of menu selections for lunch and dinner. Lunch items include pizza, grab & go sandwiches, salads and soup. For dinner, the Palm Springs Aerial Tramway offers a special Ride ‘n’ Dinner combination ticket from 4:00 p.m. daily with dinner available from 4:30 p.m. Prices for the combination ticket are $36.00 for adults and seniors, and $23.50 children ages 3-10. Menus are subject to change but a sample dinner menu may be downloaded on this page. Reservations are not taken. A full cocktail bar offering a variety of alcoholic beverages and appetizers, and is located on the same level as the restaurants. Group rates are available with a two-week advance reservation. Some restrictions apply. Holidays excluded. call 760-325-1449 or e-mail groupsales@pstramway.com. Prices and menus are subject to change without notification. Elevated Experiences, Inc. provides all food and beverage services at the Palm Springs Aerial Tramway.